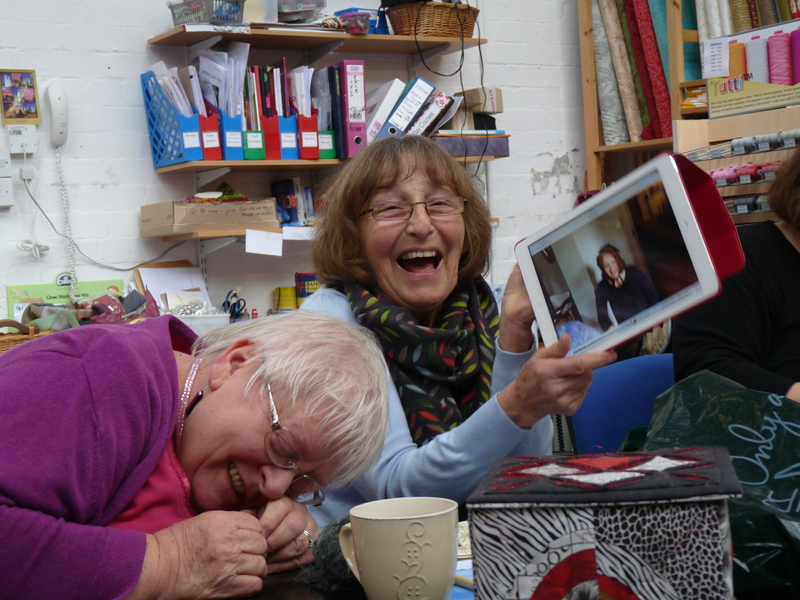 For today I wanted to share with you a quilt retreat that I was invited to at Parceval Hall, Skyreholme. The venue was on another level from the kind of places we are used to, owned by the church it is the most tranquil place to spend time. Thank you Connie and Di for the invitation and I look forward to visiting you again next year. Brrrrrrr. The central heating went on for the first time last night and autumn is now well and truly upon us, the trees outside are not looking quite as green as they were leaves are more yellow and coming down at a great rate of knots. This mornings tack and chat was the usual lively affair, especially as Tricia graced us with her presence, she played truant last week so was supposed to be on her best behaviour this week. Oh my word to be a fly on the wall when these three have a get together! Anyhow other things on the agenda. 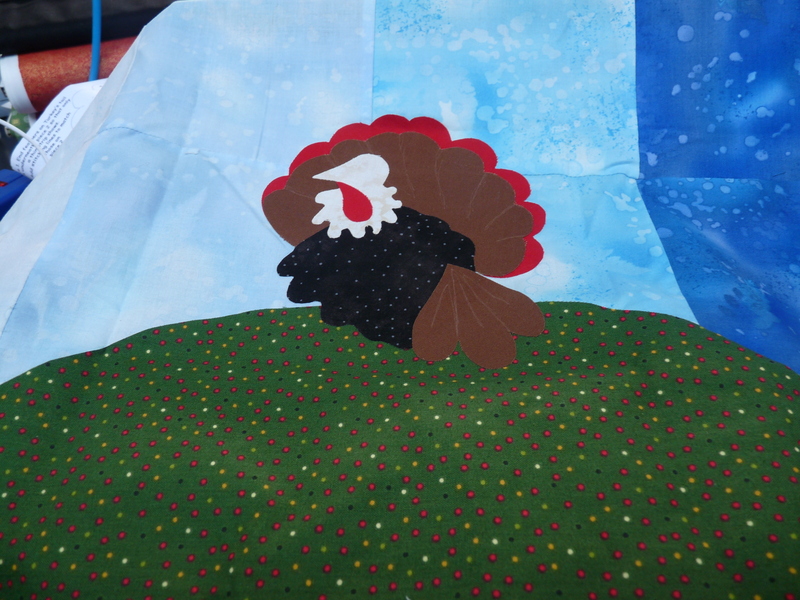 I have been plugging away at the Owl and the Pussycat quilt, I am now at the… and were married next day by the Turkey who lives on the hill bit. I’m still hoping it will be finished for Malvern and Duxford’s autumn quilt shows. Here’s a sneaky peak of the turkey. Once he’s stitched down and got a bit of detail on he will look really good. I’m so excited about this quilt and I think that you will be too. 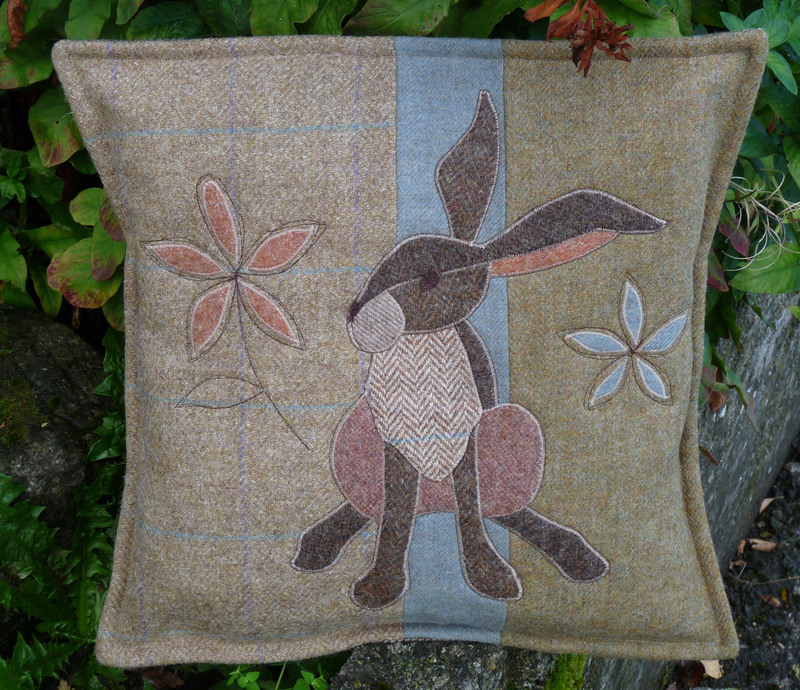 After yesterdays post where I showed you my wool tweed cushions, Michaela came to teach her new beginners class and brought with her this blooming gorgeous creation. Of course I snapped her hand off and will be selling the patterns as soon as she has finished writing them. He’s entirely made from wool tweed and Michaela has made a superb job of him. I am absolutely loving the tweed trend and I hope it hangs around for a good long while. He hasn’t got a name yet so before I make the kits up can anyone suggest one? It has been a really exciting day today because we have had a visit from the Craven Herald (our local rag) and if you ‘bear with’ I’ll tell you why. A couple of years ago I made a quilt which I planned to raffle for charity…big do’s and little do’s I never got round to it. Anyhow, when I opened the shop last year and started meeting lots of new people, many of whom are now cherished friends, I met Kate. Kate Lockwood is a prolific fundraiser for the Yorkshire Air Ambulance. During conversation I told Kate about the quilt that I had made and I offered it to her in order to raise more funds for the Yorkshire Air Ambulance. Kate registered herself in order to officially hold raffles and we set about selling tickets. We sold tickets locally and also at shows such as Yarndale, The Great Northern Quilt Show and The Knitting and Stitching Show at Harrogate. In total we raised £558. I would like to say a huge thank you to everyone involved, to Kate, the WI’s who sold loads of tickets and every person who bought a ticket. The winner was a lady called Anthea from Harrogate (great name.) I hope you will get many years of enjoyment from it. 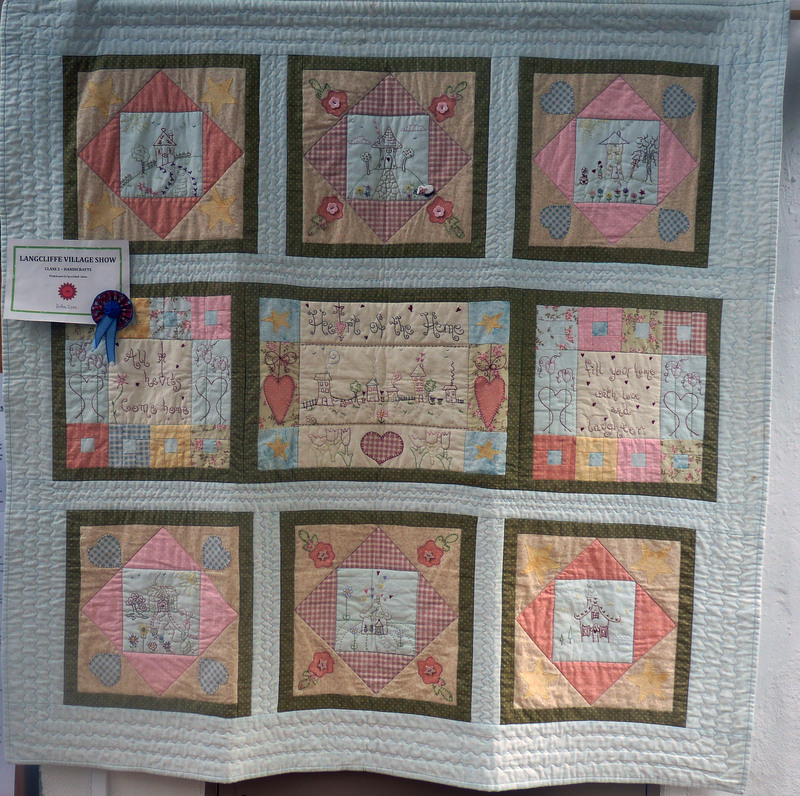 Below is a picture of the quilt. I hope you will agree it is lovely. 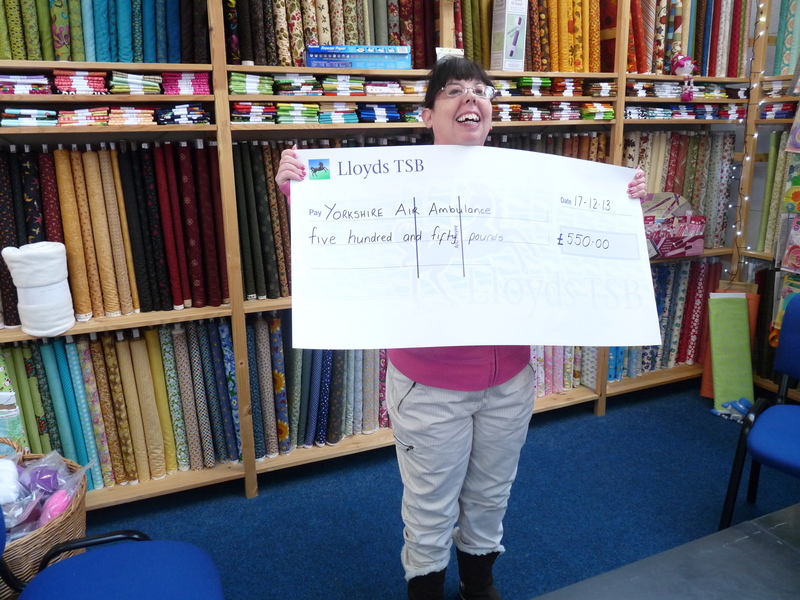 Gillian is displaying the cheque which we presented to a lovely lady called Ruth who was representing Yorkshire Air Ambulance. It says £550 which was a typo by me the actual total is £558. Good effort everyone! 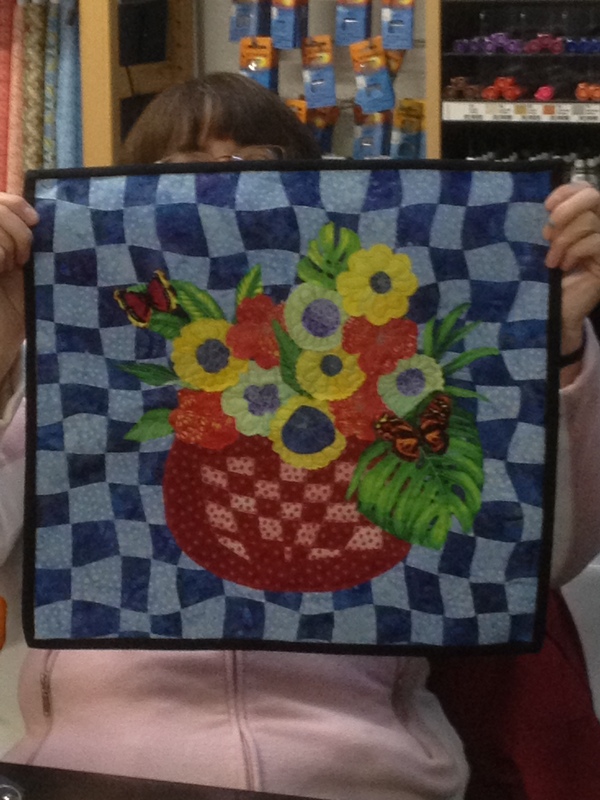 15 months ago we started our first sampler quilt course at Quilting Antics. I remember that first session so well, there was hardly a sound 9 ladies, most of whom had never met before, sat in silence headaches developing because they were concentrating so very hard. By session 10 however you could barely hear yourself think because this new group of firm friends were chattering so much…it was wonderful! 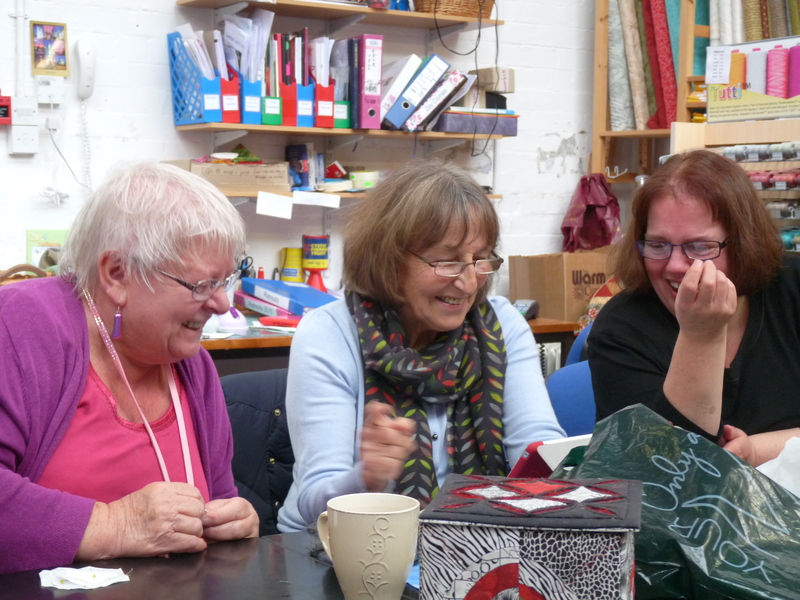 Our ladies have all come on in leaps and bounds developing their skills every time they visit the shop. Today I want to share with you parts of Mandy’s journey. If I told you that the first session reduced Mandy to a quivering wreck you wouldn’t believe me now but its true…she was!!!!! 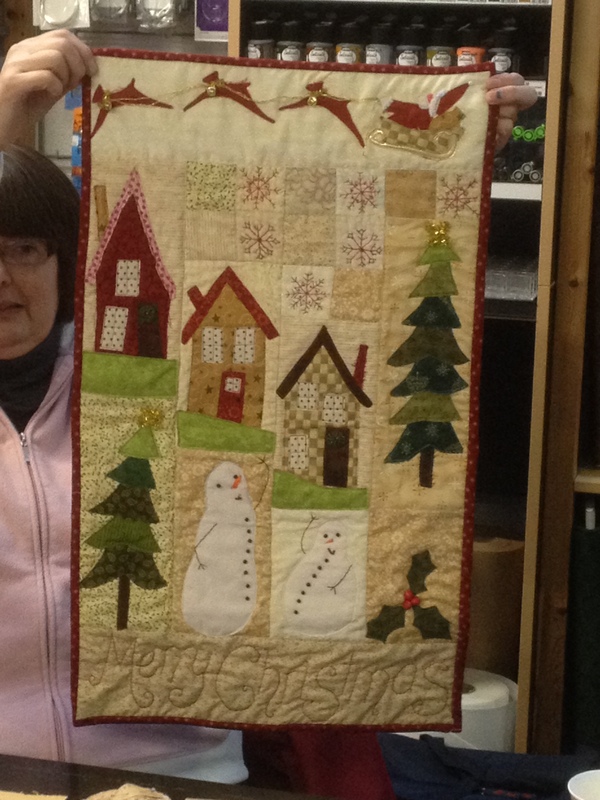 This is Mandy’s interpretation of Happy Scrappy Christmas, there is an unsaid competition among the students to ‘bling’ this wall hanging up, so it will be interesting to see what finishing touches Mandy adds. 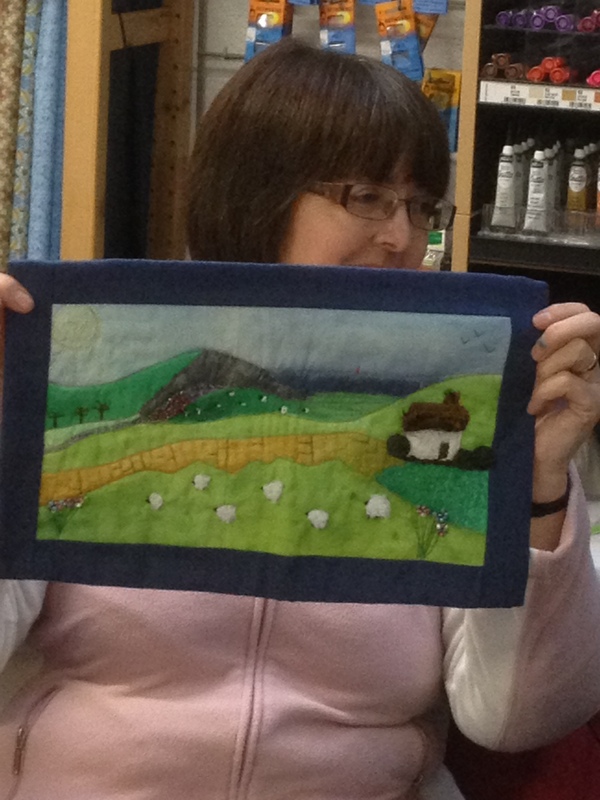 Next comes Mandy’s textured landscape. All our students made their own landscapes from views which were important to them, I love how this one conjures up the Middleton’s farm. 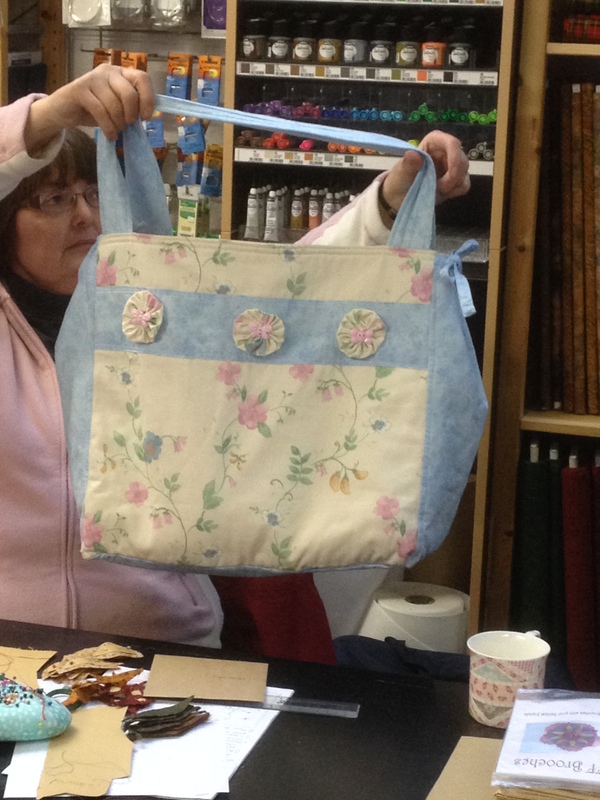 A while back we ran a class on bag making, Mandy took her skills and has now created her own bag, to her own specifications clever lady! 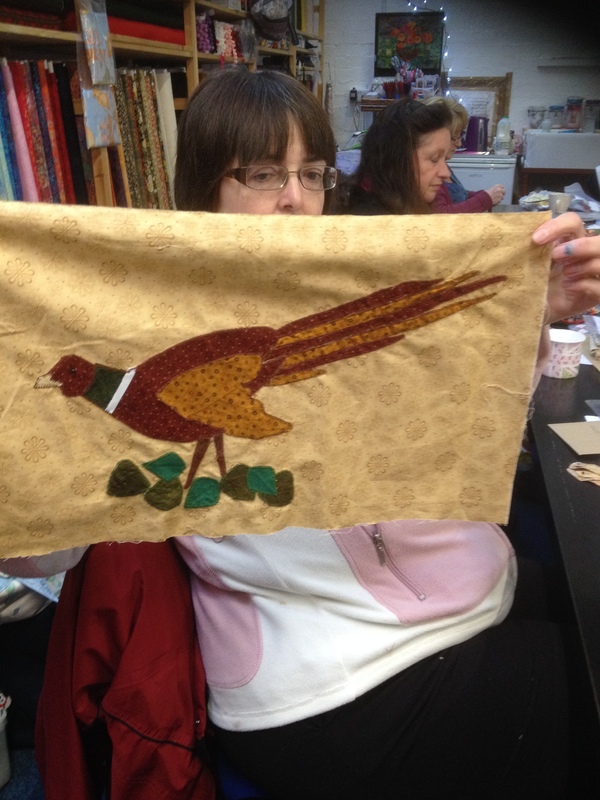 Finally, look at this unique pheasant design which Mandy has appliqued to go into her improvers quilt. Just see how your skills can quickly build and your confidence grow at our classes. 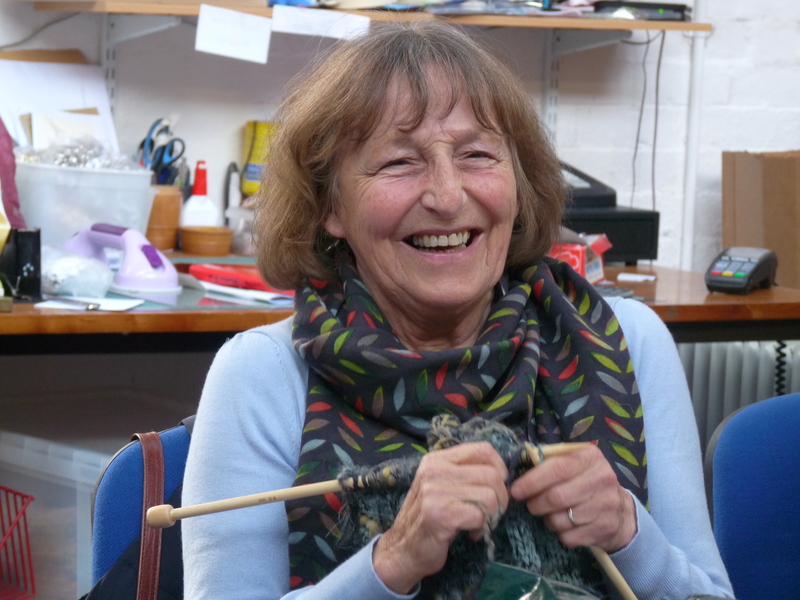 If you fancy taking part in any of our classes, you can find out what we are offering by clicking the workshops and classses tab at the top of this page. Ring the shop on 01729 824708 to check on availability and we can book your place for you. 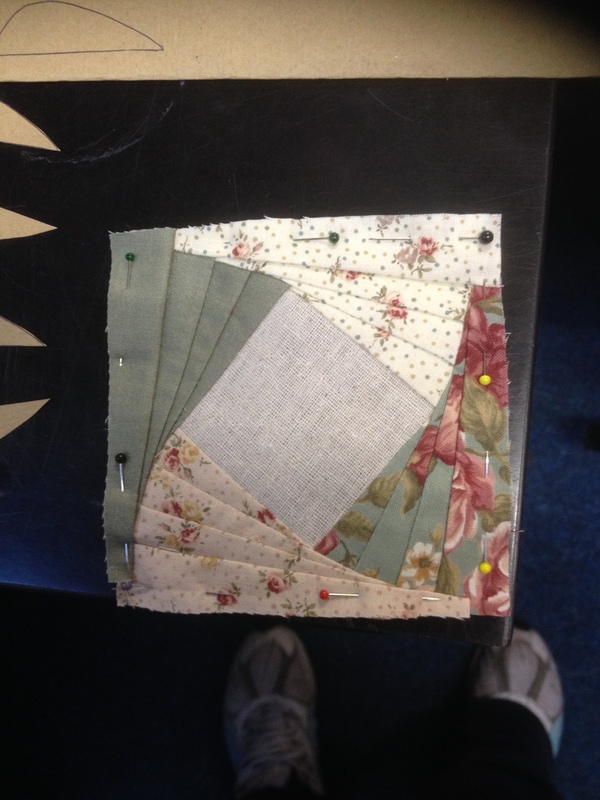 If you fancy learning how to make a patchwork quilt, we will be starting new classes in the New Year. Don’t forget if you are stuck for what you want for Christmas you could always get a gift voucher from us, several people have bought their nearest and dearests places on classes. 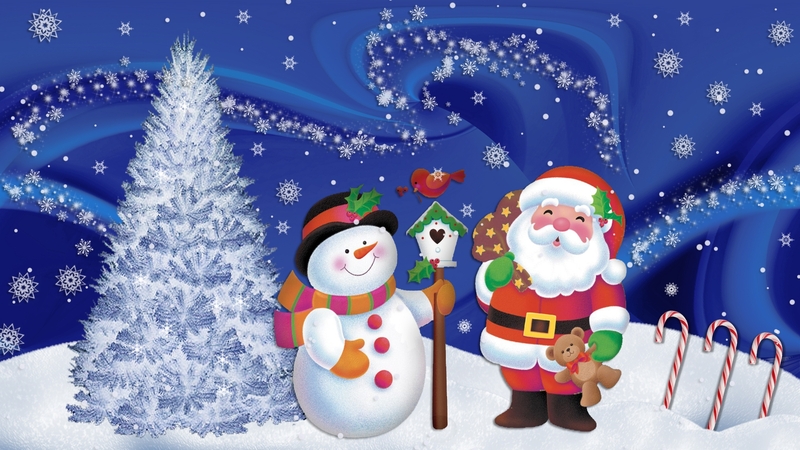 Anyway for the first time this season I will wish you all a very happy Christmas!